(Waldorf, Md., Dec. 14, 2016) – The Southern Maryland Blue Crabs have unveiled the team’s new official website on Wednesday. The revamped site was designed and crafted in partnership with Infinity Sports & Entertainment and the Blue Crabs to improve fan experience on the team's website. The updated scheme is a refreshing change that boasts artwork surrounding the team’s tenth anniversary. Pictures of the stadium, players and events from the past and present surround the site as fans navigate. The website will feature an easy to use home page with quick links to purchase tickets on the top of the site and a listing of the next three games to come during the season. It is easier than ever to catch up on the latest updates with the news tab, the front page, and the official “Crustacean Confidential” blog. 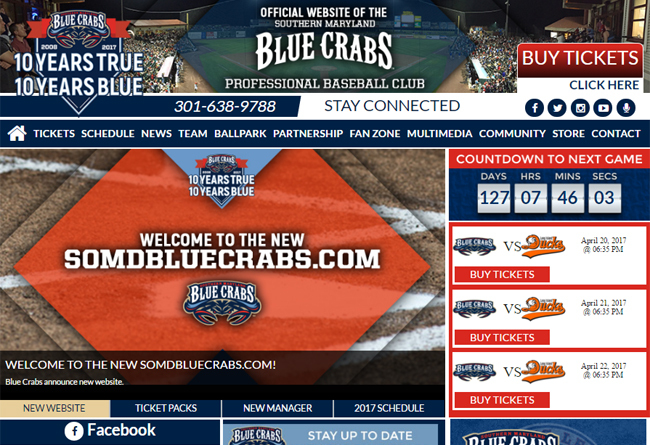 For all of the Blue Crabs fans on the go, the new website features a mobile friendly layout as part of its ‘responsive’ design. The Blue Crabs website can be located at www.somdbluecrabs.com. The Blue Crabs play 140 regular season games in the Atlantic League, considered the highest level of minor league baseball. The Blue Crabs play at Regency Furniture Stadium in Waldorf, Maryland. The franchise will look to open its 10th season on Thursday, April 20th, 2017. Please call 301-638-9788 or visit www.SOMDbluecrabs.com for more information and to reserve your seat at the ballpark today!